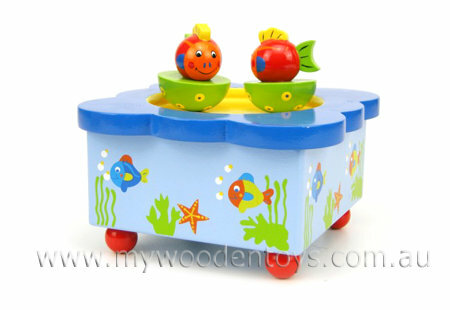 Music Box Wooden Dancing Fish is a gorgeous little music box with two fish which spin round and round. The brightly coloured fish are magnetic and dance as if by magic as the music plays. Beautifully painted with a sea theme in eye catching colours this is a well made little toy that will last. Size: The Music Box is 12 x 12 x 8 cm tall and the fish are 4.5cm high. Material: Wood, Child -safe paint. Metal clockwork components, magnets. We like this because: "such a sweet little music box that is perfect for a childs room."